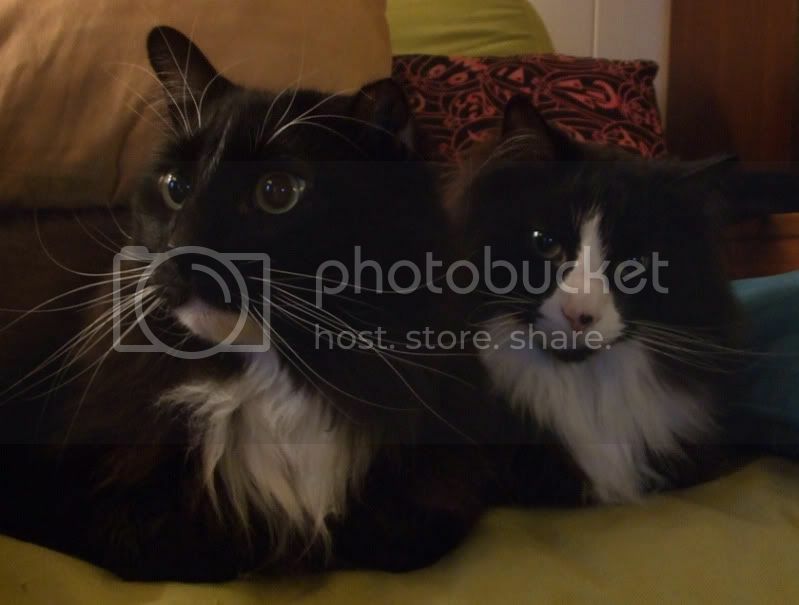 I must have cats on the brain, or at least more than usual, for this Friday, I have a lot of kitties to share with you! I've been meaning to update everyone on my former office cat, Marlo. She finally has a home! Actually, she's had one for a few weeks, but I wanted to wait til all her tests came back and to make sure things were working out before airing the news. All the tests came back clean, and she has been adjusting to her comfortable new life with a loving family and her new name. Miss Marlo the Office Cat has become a Sarah, and is making one little girl a very happy camper. In honor of this good news, I wanted to share a collection of my favorite photos of my time with her. It was a cherished time in my life, and I desperately miss her every day, but I am comforted knowing that she has a permanent home. Now, onto my next project. Last Friday I posted about another cat that has taken up residence next to my office. I'm trying not to get too attached like I did with Marlo/Sarah, but this new little kitty is determined to win me over! I noticed her a few days ago sitting on top of my car, staring at my office. Oh my. 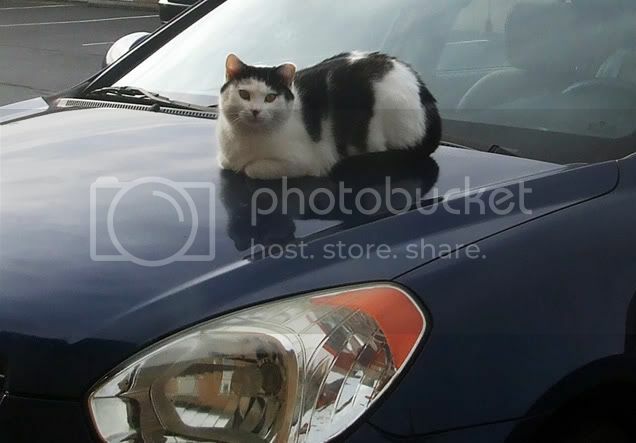 I'm still looking for a home for her, but til I find one, she's more than welcome to sit on my car. And don't worry, she gets many petting sessions during the day and plenty of food and water. She's happy. I just know she'd much rather be inside on a full-time basis. I've been on a coffee kick recently and last night I was enjoying a nice hot cup while doing some sketching. I was sitting in the floor of the living room, for some reason. It is a well known fact around my apartment that if you leave your seat, Mr. F will immediately take it over. This is what happened when I moved from the couch to the floor. He dashed over to the couch and snuggled down in the spot I had warmed for him. A bit later Mr. E decided to join him. It was too adorable not to share. 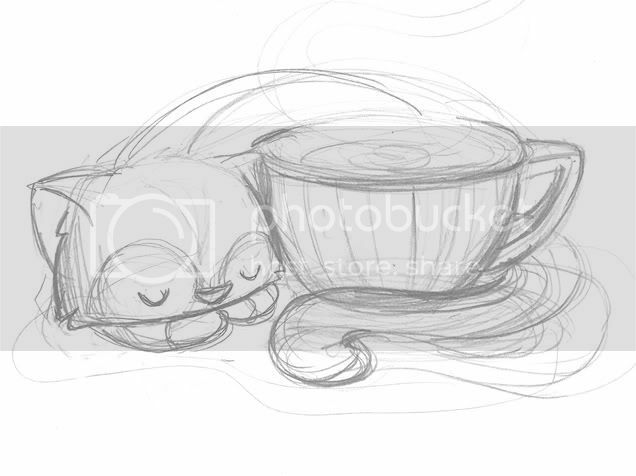 While they were being cute on the couch, I kept sketching away and sipping my coffee. Inspired by my coffee drink and the cats above, I did this quick doodle. It's everything that I think of right now when I think of cozy. Cats and coffee.